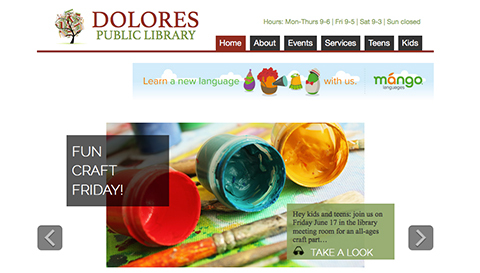 Cortez Web Services is proud to introduce you to the new Dolores Public Library website. With a beautiful user interface, visitors can find all the information they need about upcoming events, new release book suggestions, and other library services in one place. The clean, modern website also features integration with many media services the Dolores Public Library offers to their patrons. Cortez Web Services also designed a custom content management system (CMS) for the Dolores Library staff so they can easily update the many different dynamic parts of their site’s content.